As good gardeners, you will all know the pale yellow native primrose that speckles hedgerows in the spring and many of you will have bought the colourful modern hybrids, available outside every greengrocer through the winter. Some years ago, I met purely by chance a guy, who I later discovered bred primroses and has created a range of amazing cultivars. 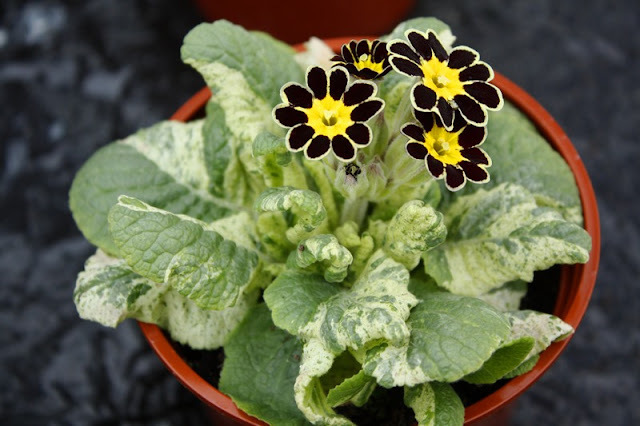 We call him Primrose Richard! Over the years I have visited his greenhouse on the outskirts of Nottingham, a number of times and on each occasion have been enthralled, hearing him describe each batch, explaining what he is looking for and how the improvements have developed. 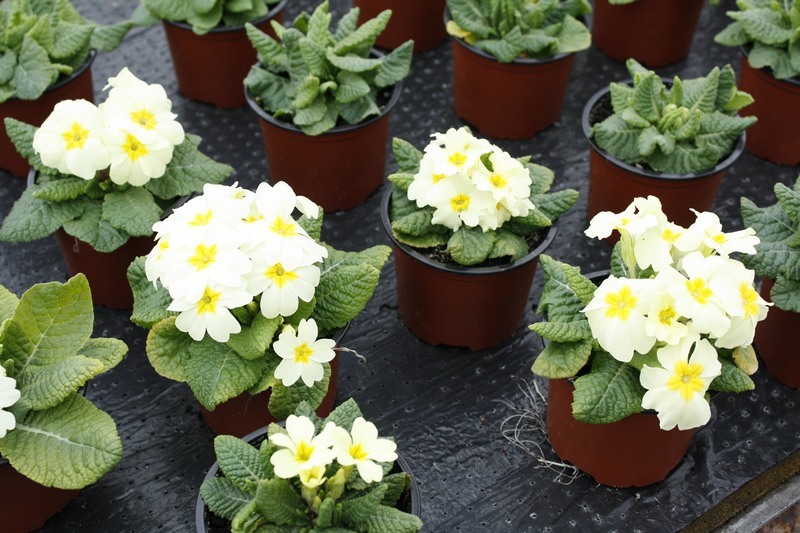 Its a slow process and Richard has been working on primroses now for 25 years. I asked how many different parent species he had been working with and amazingly its just three. 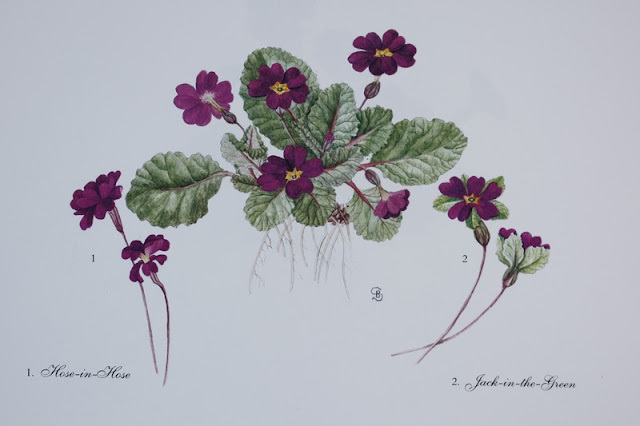 The common hedgerow primrose, Primula vulgaris, the cowslip, Primula veris and the common purple flowered Primula 'Wanda', whose origin I can't find. 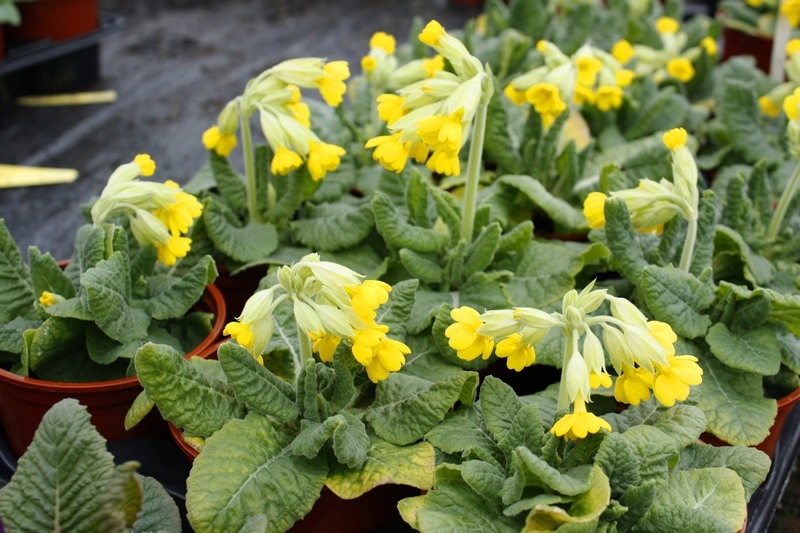 Most modern commercial primroses are Fi Hybrids which means that each year they must be produced by crossing two specific parents. 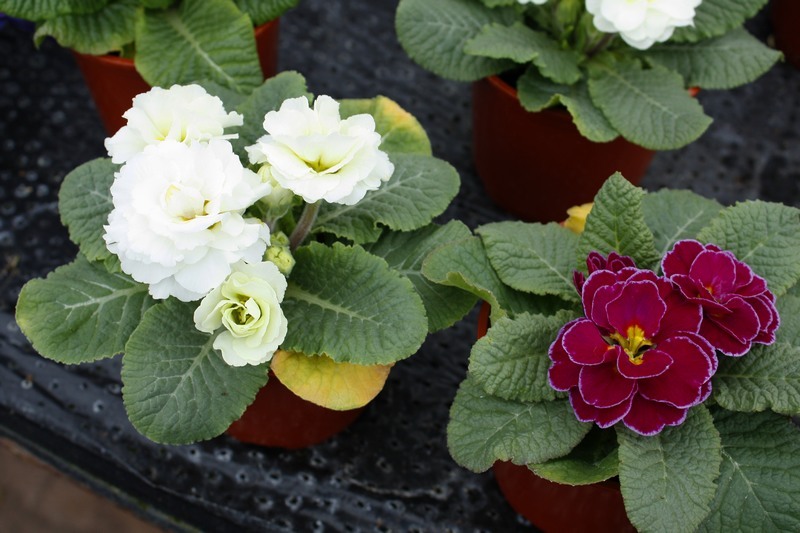 By contrast most of Richard's hybrids are inbred lines that breed true from their own seed. 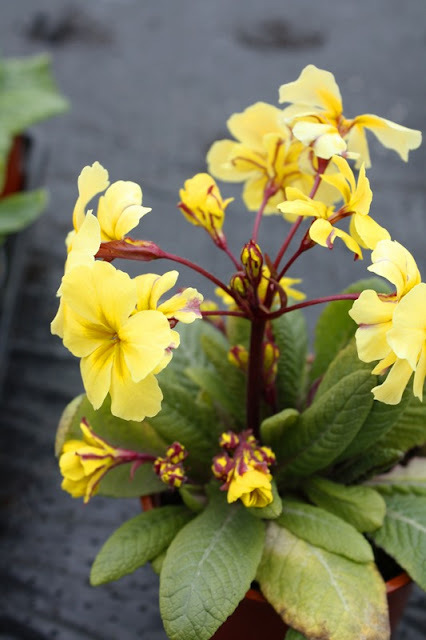 If you remember back to your school botany classes, you may recall that primroses come as either pin-eyed or thrum-eyed, depending on whether the stigma is above or below the anthers, which affects the pollination and ensures that primroses are cross pollinated. 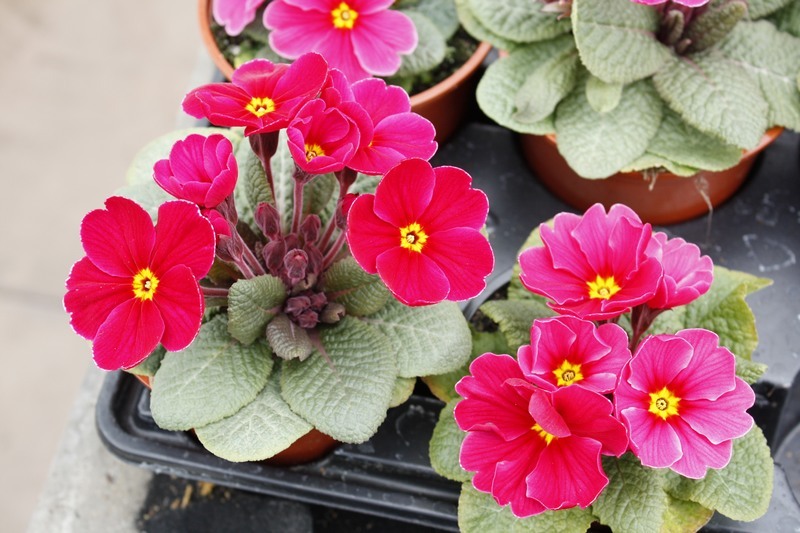 There is a third type having a homostyle (anthers and stigma at the same level) which are self-fertile. 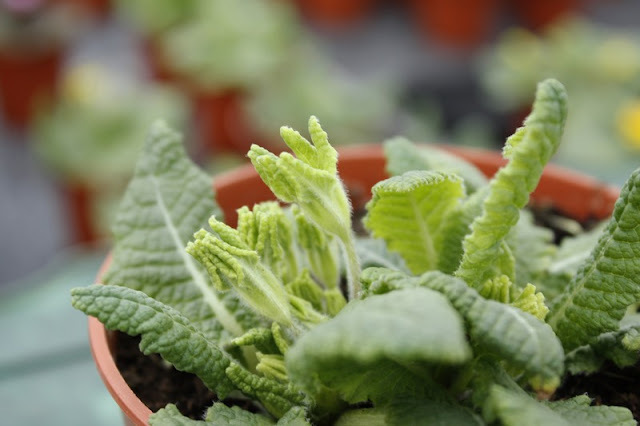 Hybridisation is a slow process and involves careful selection each year for improvements or variations that are worth developing. 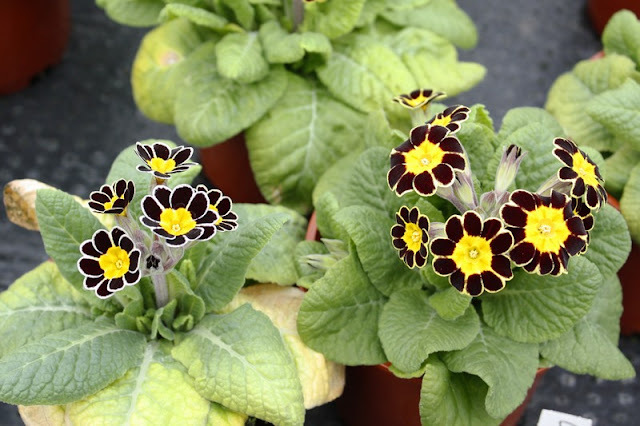 One of Richard's strains that has been successful are the blue and white striped cultivars, now available as 'Zebra' in Europe and 'Stonechurch' in the UK. Alongside this is a pretty pink and white strain, although Richard comments that he's had no improvement in this in 15 years! Amongst Richard's breeding stock there are a number of curiosities that may or may not be of breeding use. Some are doubles with obvious commercial potential. In other cases, the sepals or petals are altered in some way to make the flower unusual. 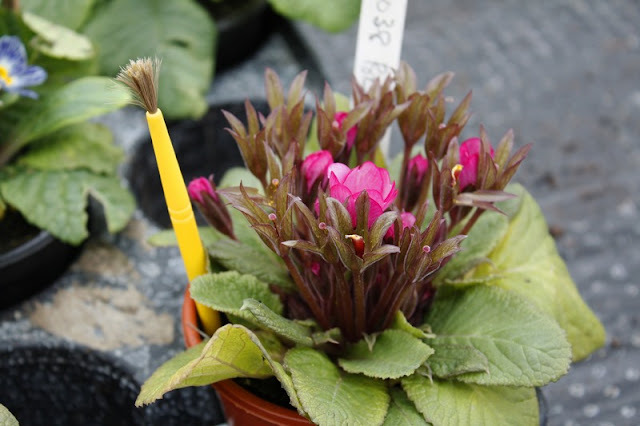 I particularly liked the yellow primrose with the red stem. 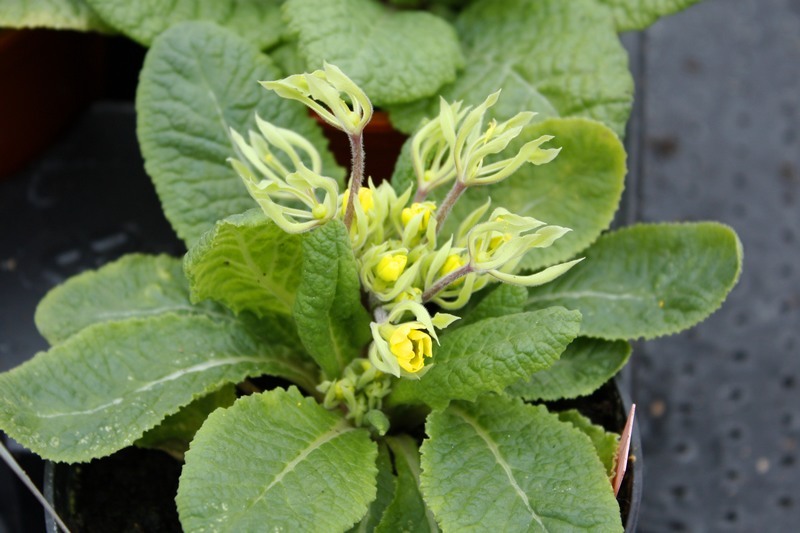 The sepals which are normally fused into a tube had mutated into a second row of petals with pretty red veins. 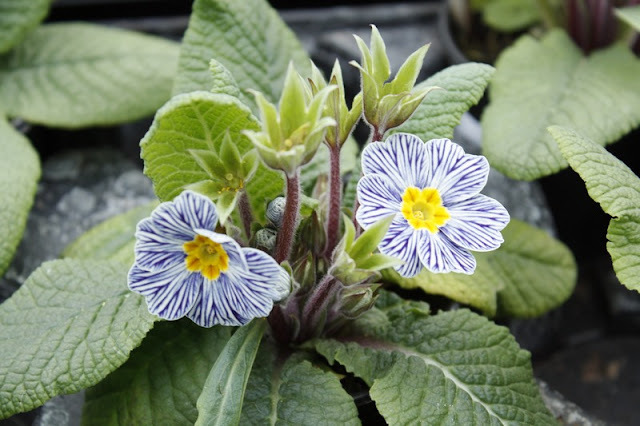 Another of my favourites was a strain with not only striped petals but oak shaped leaves. Definitely collector's items if ever they become available. 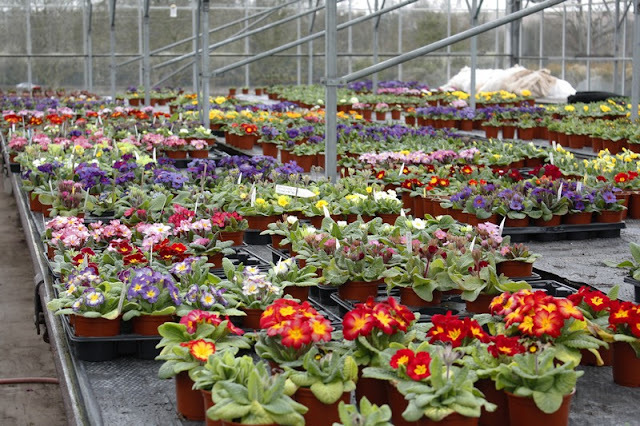 Each year Richard grows between 10-15,000 plants in a large modern unheated greenhouse. Results can be unpredictable and he always stores 50% of his seed for a future year in case of a crop failure which would otherwise mean the loss of a breeding line. Seed is sown in July and the new season begins. Plants are all grown in a peat-based compost which Richard believes as yet has no replacement. (I have to agree!) At this time of the year, Richard is busy taking notes of each batch as flowers open and pollinating the flowers ready for the next seed crop. 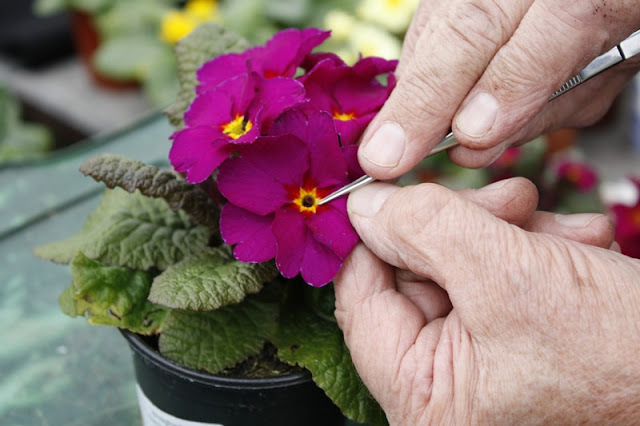 Pollination takes place with tweezers, transferring the minute pollen to the stigma of the selected parent plant. 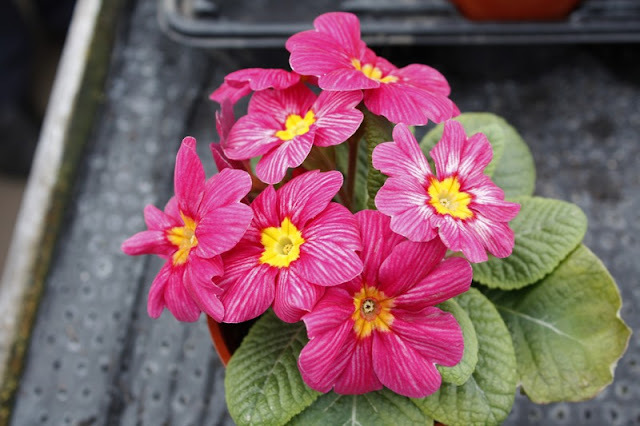 Just a few batches have the self-compatible homostyle and these can be self pollinated with a small paintbrush which is kept with each batch to avoid unexpected crosses. 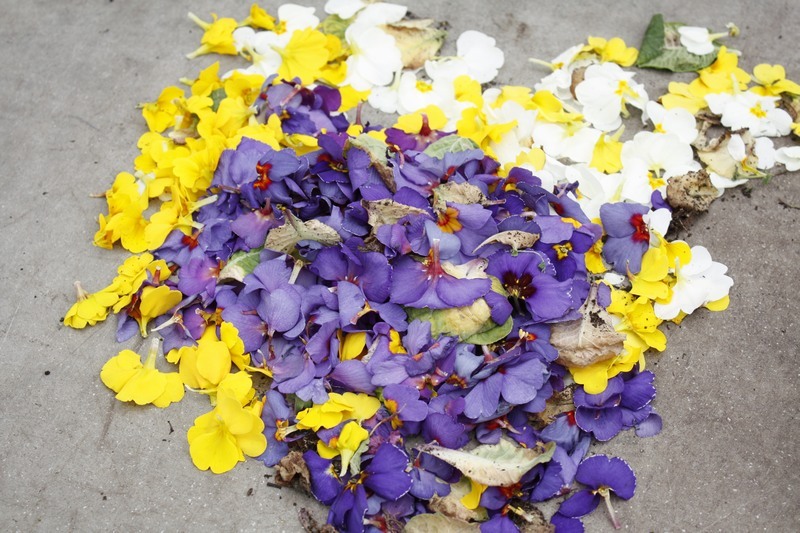 Petals are removed to indicate that pollination is complete and to allow the seed to develop without the risk of disease from decaying flowers. The season is completed in May/June when the seed is harvested for the next year. "Just three weeks off before we start again" says Richard. 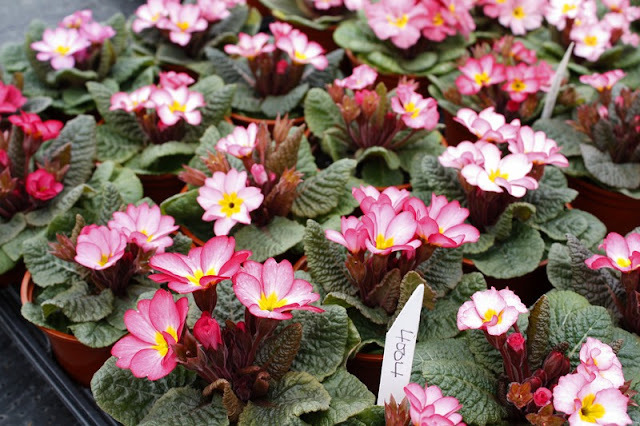 Some plants are sold to local garden centres and seed has now been released to commercial producers but basically this is a labour of love! 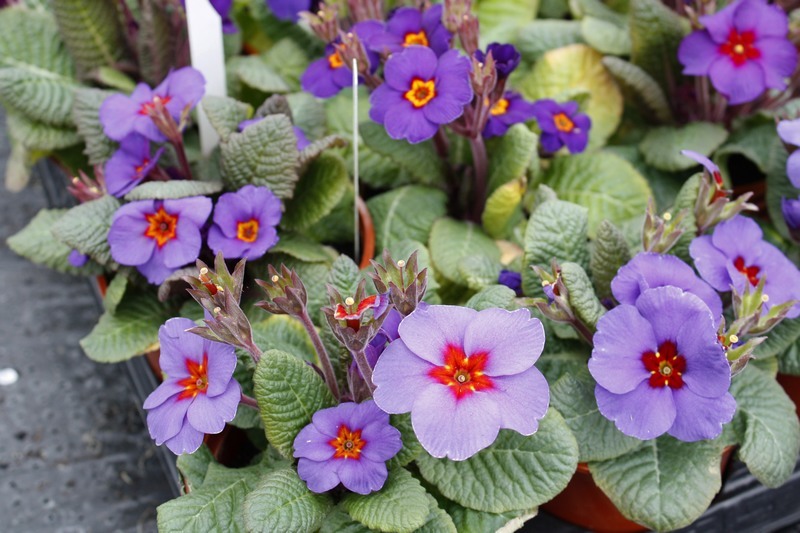 But who couldn't fall in love with these charming little plants? Looks like Richard is doing a fantastic job there! I was smitten with 'Zebra' when I saw it last weekend. Richard is a wonder and the (unsung) work he has done with this beautiful plant deserves high praise indeed. 'Wanda' is a clone of Primua x pruhoniciana which was produced by breeding P.juliae into the already well established coloured forms of primrose soon after its introduction in 1911. 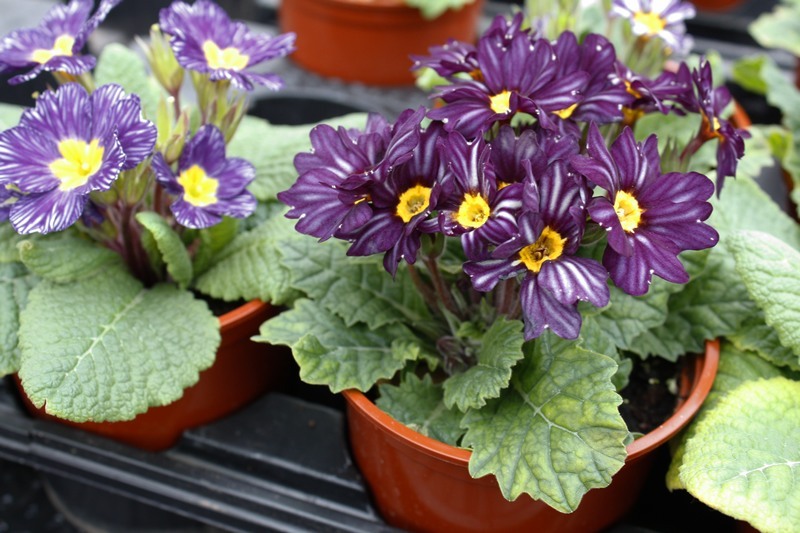 Its genes allowed the development of the 'purples and blues' in modern polyanthus. Chad - many thanks for the extra information - I guessed you would know if you were still following! You'd find Richard's work fascinating!